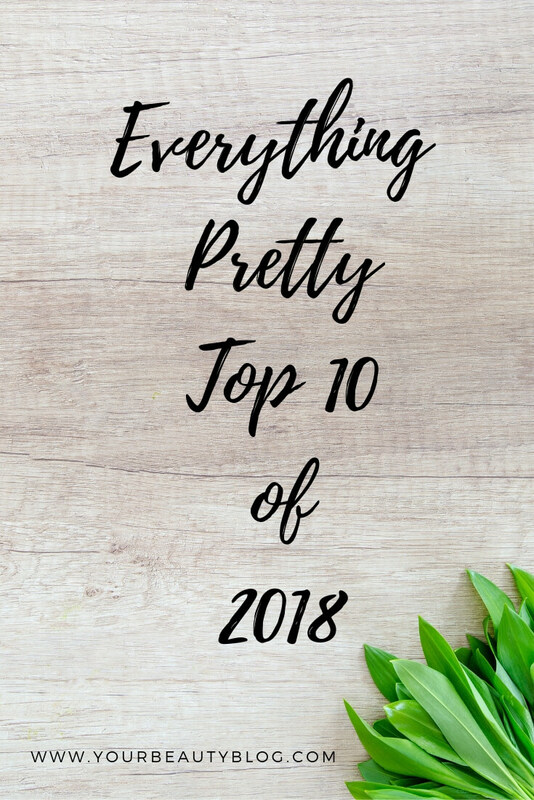 I'm pretty sure that it's only been a few weeks since I wrote my Top 10 Posts of 2017 post! Where did 2018 go? 2018 was a quick year, but it was a good one. Once again, I got to take my family with me to travel. We aren't a traveling family, so it was a really big deal for us to take our mini trips. With having dogs, cats, chickens, and goats, travel isn't easy for us. This year we got to visit Great Wolf Lodge for the first time. We had so much fun there! The kids got to do a lot of dry land activities, and they made a lot of memories there. We also got to go back to Kalahari, but this time we spent the night. Two whole days of Kalahari was amazing! We can't wait to go back. As for 2019? I haven't really decided. I think what I'm doing now is working fairly well. I may go back to two posts a week just because of time restrains. I'm not entirely sure on that yet. I do want to take a moment and thank you, my readers, for reading, commenting, emailing, and sharing. I've seen good growth this year. I think my posts have gotten stronger and better, but I know it's because my readers are engaging more too. These adorable gingerbread house soaps are decorated with whipped melt and pour soap and painted mica. You can have a lot of fun decorating these, then you can use them as soap. Each year, my daughter makes a gingerbread house. She loves decorating cakes, cookies, and especially gingerbread houses. I'm crafty and can make many thing, but a cake decorator I am not. So I used soap as my medium of choice. I found an adorable gingerbread house mold that's probably meant for cake or some other bakery item, but I used it for soap. The plain soaps were adorable on their own, but I decorated them like you would a real gingerbread house. I think they turned out so cute! Put these on a pedestal dish in the guest bath for an cute seasonal touch. Gingerbread houses are generally made at Christmas, but I think they would look cute all winter long. This DIY bath and body gift set makes a great gift for Christmas or any time. Includes recipes for an emulsifed whipped sugar scrub, lip balm, lotion, and soap with a natural Intense Berry scent. This year, I couldn't figure out what to give my son's therapists. I usually make them cute travel coffee tumbler with a Starbuck's gift card because they are on the road all day between clients. 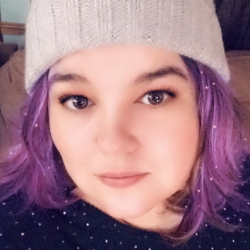 I did that last year, so I wanted something new for this year. 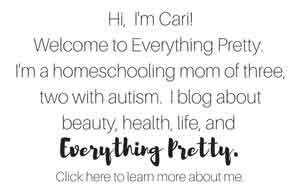 My son has two (soon to be three) therapists that come to the home once or twice a week year round. They both have the patience of a saint. Thanks to their help, Caleb has made so much progress in three years. He was almost completely nonverbal two years ago. Now he holds a conversation with nearly anyone and only shuts down when it's time to write. It's amazing to see how far he's come! I wanted to get them something special and something that would pamper them a little. Something that they would enjoy but maybe not get for themselves. So I decided to make them DIY bath and body gift sets with shea butter lotion, an emulsified whipped sugar scrub, shea butter soap, and lip balm. These gingerbread jelly soaps are so cute and so much fun to use! They are made with natural essential oils for the scent. Are you decorated for Christmas? I am not all decorated yet. We put the tree up a few weeks ago, but that's as far as I've gotten. Between Caleb's ETR and IEP and all of the evaluations and my being sick, we just didn't have time. Until three years ago, I went all out and decorated the entire house. You couldn't look anywhere without seeing a Santa Claus. I wish I had the energy to do that again, but sometimes just had to be let go when I started homeschooling. I still wanted a little more Christmas spirit in the house, so I made these gingerbread jelly soaps. I set them in the kitchen and in the bath to use as a hand soap. My daughter uses them in the shower, too. How to make a skinny peppermint mocha recipe at home with fewer carbs, calories, and fat. You don't need any special equipment to make this delicious healthier version of your favorite coffee house drink. It's been a fairly mild winter, but I'm still freezing. I am just not meant to live in Ohio. I should be on some tropical island where the temperature is between 68 and 72 degrees Fahrenheit all year. In the evenings, I get cold. I cuddle with my chihuahua, Nacho, under a blanket and sip a hot drink. 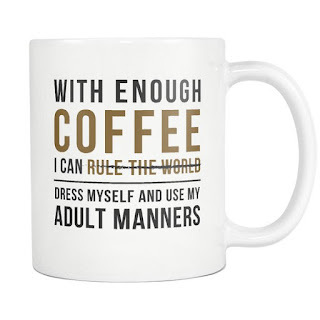 I'm kind of a coffee addict, so I usually make a coffee drink. I have been all about peppermint mochas lately, so I make this skinny peppermint mocha recipe sometimes in the evening. I'm a busy mom, so I don't want to spend time making this drink when I could be spending time with my kids. I look for recipes that don't need any special equipments or ingredients that I won't use for anything else. This skinny peppermint mocha recipe is definitely easy. You can make it in about 10 minutes, and you don't need any special equipment. 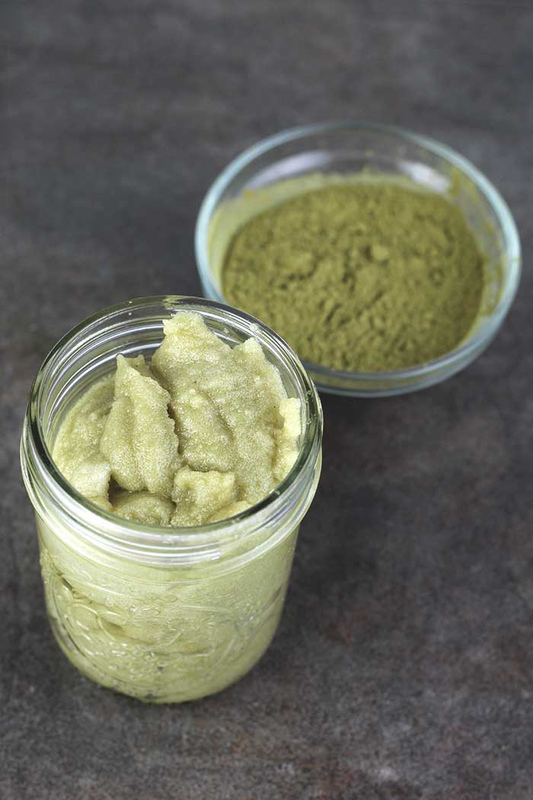 This peppermint matcha green tea sugar scrub is full of antioxidants and smells wonderful. Red and green are the colors of the season. I prefer to use natural ingredients to dye my DIY bath and body products, and what better way to get green than with matcha green tea? 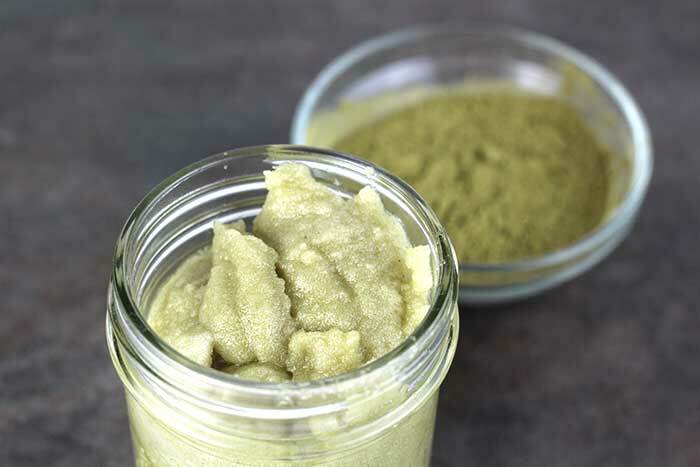 Since I'm all about peppermint lately, I mixed things up with this matcha green tea sugar scrub and added some peppermint. I figure peppermint is red and matcha is green, so this is really a Christmas sugar scrub. I made this an emulsified whipped sugar scrub, so it's a more luxurious than other sugar scrubs. Whipping it makes is really light and fluffy. I also added an emulsifier, so this scrub turns into a lotion when you use it. Combine this with the ingredients that I used, and this is a great sugar scrub for dry skin. I prefer using sugar in my body scrubs because it's gentler on your skin than salt is. Brown sugar is gentler than white sugar, but I just use white sugar in most of my scrubs. You can use this scrub on your hands, feet, or body. I don't recommend using a scrub made with white sugar on your face because it can be too harsh. I used avocado oil because it's winter and my skin is dry. Avocado oil is an excellent moisturizer thanks to the omega-3 fatty acids. It's also high in vitamins A, D, and E for your skin. Avocado oil also contains lecithin and potassium to nourish your skin. Avocado oil is also high in antioxidants, and the vitamins promote healing for dry or flaky skin. 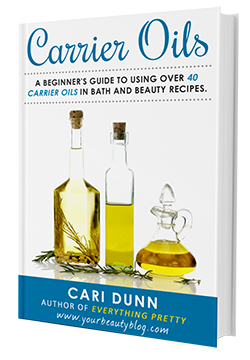 Learn more about the different carrier oils in my book Carrier Oils. What I love about this sugar scrub is that it turns into a lotion as you rinse it off. This is because of the emulsifying wax . Emulsifying wax is often used in lotions to bind oil and water. When you use it in a sugar scrub recipe, it binds the oil in the scrub with the water when you rinse off the scrub to create a lotion. I added stearic acid because it's an essential fatty acid for your skin. It also helps clean the skin, and it can clean sebum from the skin so this scrub cleanses as it exfoliates. I added cocoa butter because it's high in antioxidants. It's also moisturizing, so it's wonderful for dry skin. Since cocoa butter is a solid at room temperature, it helps this scrub whip up and hold its shape when you whip it. I like using coconut oil in my sugar scrub because it penetrates deep into the skin to moisturize your skin. Its essential fatty acids moisturize your skin, and it's great for dry skin. Since coconut oil is a solid at room temperature, it also helps this sugar scrub whip up and hold its shape. Shea butter is my favorite butter to use for my skin. It has vitamins A, E, and F for your skin. It's essential fatty acids moisturize dry skin without being overly greasy. Matcha green tea is my preferred to use green tea because it's easier to use than green tea because it's already a powder. Matcha green tea, like all green tea, is high in antioxidants to neutralize free radicals. The chlorophyll, which is what makes this powder green, is a detoxifier to help remove toxins from your skin. I added peppermint essential oil because it smells amazing and is perfect for winter. Peppermint has menthol, so it naturally cools your skin and helps brighten dull skin. Vitamin E oil is also a great antioxidant. Some people call it a preservative, but it isn't. It does, however, help extend the life of carrier oils so they are shelf stable longer. Not all vitamin E oils are the same. I've used some that weren't much thicker than water. Now I use Crafty Bubbles vitamin E oil . It's my favorite because it's really thick. This recipe doesn't have any water in it, so it really doesn't need a preservative. Most people dip wet fingers into the jar, so I feel a little better having a preservative in this scrub. If you are making this for personal use, you don't need a preservative. Just make sure that you use it within a few months and don't dip wet fingers into the jar. If you're making this to sell, I highly recommend using the preservative. Phenonip is a great preservative for oil based products like this sugar scrub. It helps protect your recipes from bacteria, mold, and fungi. Use a digital scale to weigh your ingredients. Since you're using emulsifying wax and a preservative, it's very important to get accurate weights and not use volume measurements. 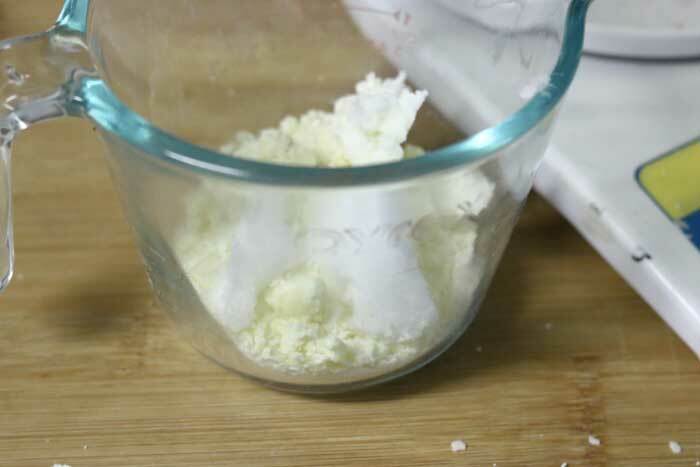 Weigh the emulsifying wax, stearic acid, cocoa butter, coconut oil, and shea butter and place in a double boiler. Heat until melted. I don't recommend microwaving this. If shea butter gets too hot, it can get grainy. If you don't have a double boiler, set a canning ring in a pan of water and place a glass container on it. I use a Pyrex measuring cup. 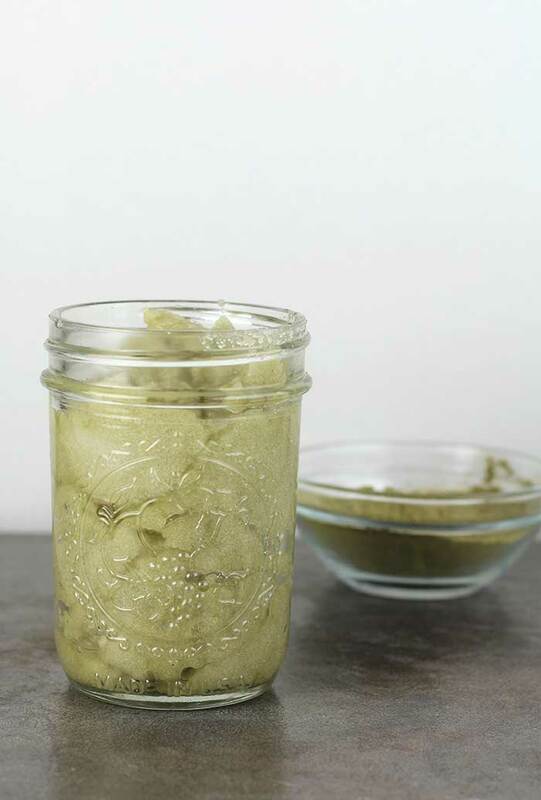 Once the hard ingredients are melted, weigh the avocado oil and pour it into the glass container. Stir well. Check the temperature and stir until it is under 175 degrees Fahrenheit. I use a laser thermometer because it's easier than using a regular thermometer. Once it's under 175 degrees, add the vitamin E oil, matcha green tea, peppermint essential oils, and phenonip. Stir well. Place the bowl in the freezer for about 10 minutes until the edges start to harden. Use the whisk attachment on your stand mixer or hand mixer to whip until creamy. Add the sugar and continue whipping. The whipped sugar scrub will see really thin at this point. As it cools and the cocoa butter and shea butters set up, they will harden and thicken the sugar scrub. 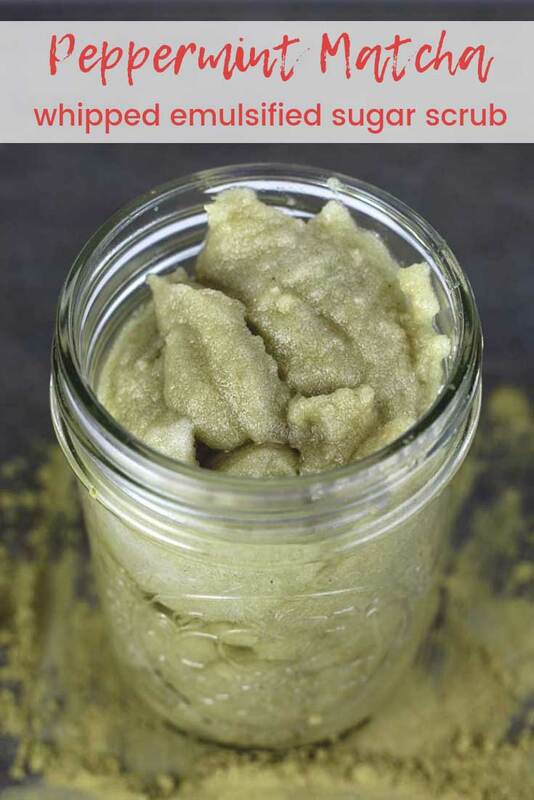 This recipe makes just over 8 ounces of sugar scrub. You can double or triple it to get more. Don't want to DIY? Try one of these handmade emulsified sugar scrubs on Etsy. 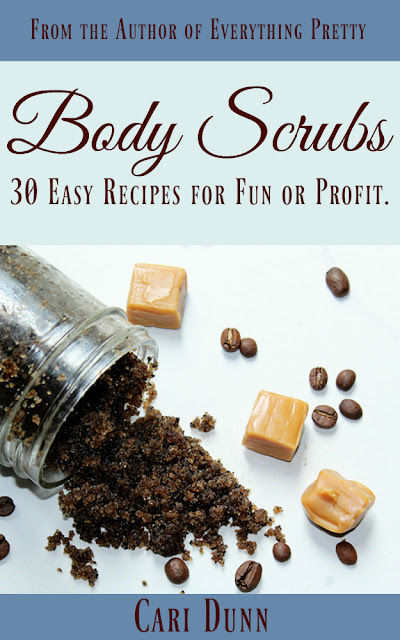 If you love making body scrubs, then you'll love my ebook Body Scrubs with 30 different recipes for fun or to make to sell! 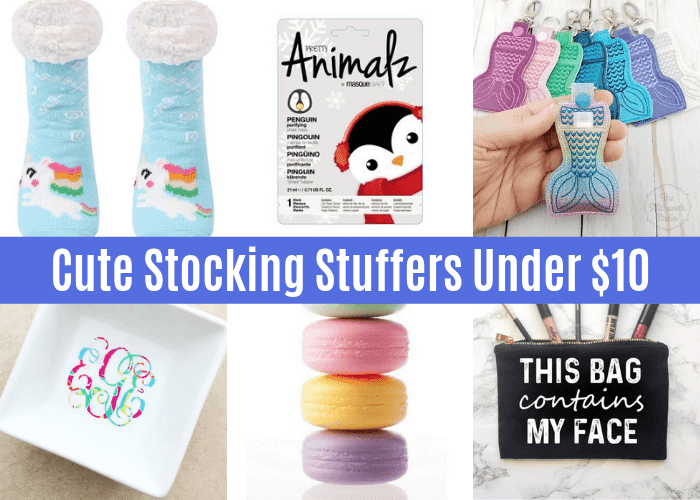 She will love these cute stocking stuffers for her. They are all under $10, and they are all adorable. I am having so much fun putting together gift guides for you this year. 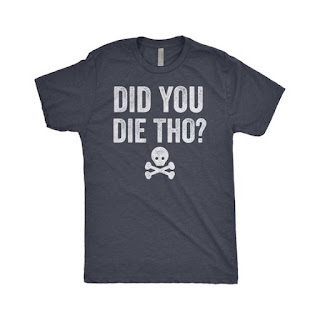 This one is probably one that you want to send to your kids or husband if they need gift ideas. I was thinking of women who like cute things (like I do! ), but this list of stocking stuffers would also be great for teens. My tween would even like most of the things on this list. 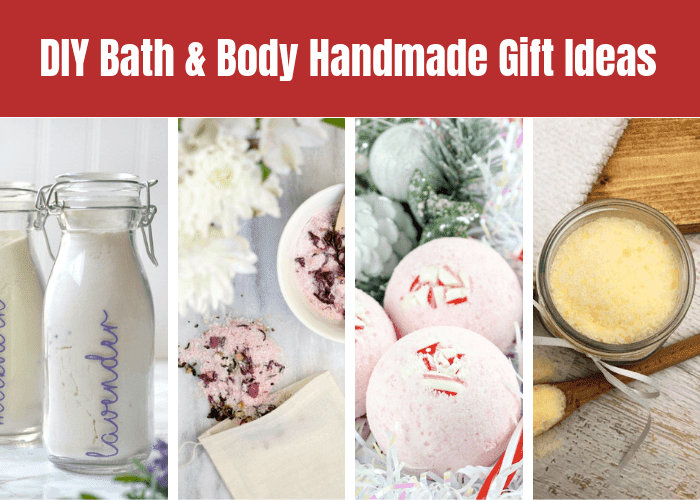 DIY bath and body handmade gift ideas to make and give to friends, coworkers, and family. I love making DIY bath and body handmade gifts for friends and family. Each year, I pick two or three different things to make, and I made large batches of them to gift. 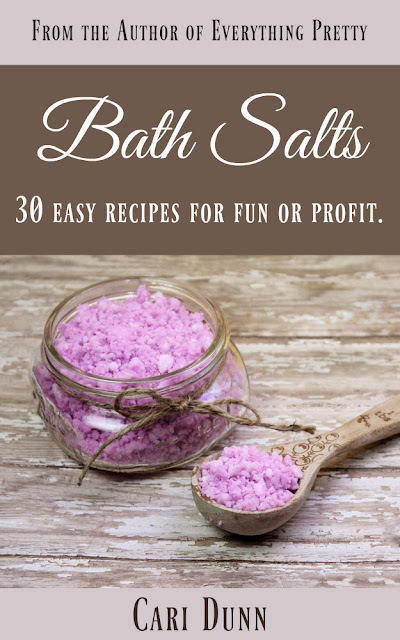 The recipients seem to love getting my DIY bath and body gifts. I used to gift them to my kids' teachers each year because I could make them inexpensively, yet they were really fun gifts. I mean, who doesn't want to get the gift of pampering? I got bath salts, now I need to take time to relax, right? Here are 21 gifts for the snarky mom. 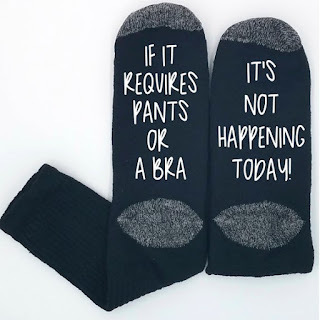 This Christmas gift guide for moms is sure to make her laugh on Christmas and every day. I may not come across like it, but I'm extremely sarcastic and snarky. I also have a super dry sense of humor that most people don't get. I think that life shouldn't be taken too seriously, and I love things that make me smile or make me laugh when I use them. Given the choice between a plain notebook or one with a funny saying, I'll gladly pay more for the funny one. Each year, I try to support small businesses and especially handmade businesses when I do my Christmas shopping. I've been selling on Etsy for 10 years now, and I still get a big smile every time my phones goes Cha-Ching! I want to make someone else smile and support a small business. 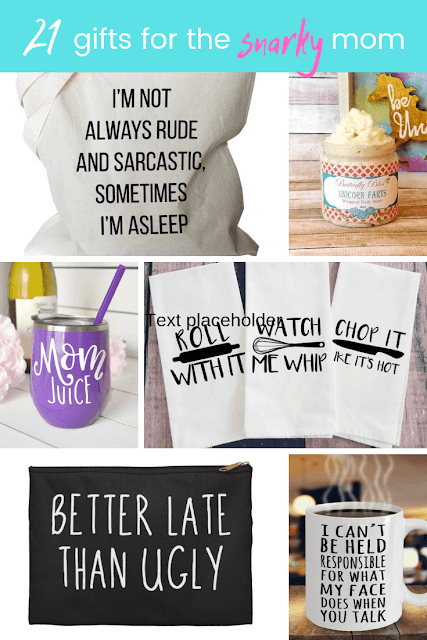 So I searched Etsy looking for funny gifts for her, a gift guide for the snarky mom (or any woman). Etsy is full of amazing items, but I had to narrow it down. 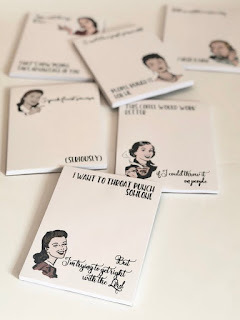 Here are my 21 picks for snarky and funny gifts for her. What woman doesn't need another bag? 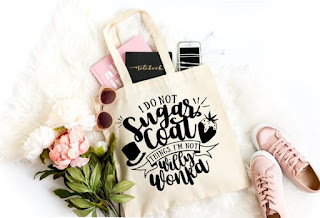 I love this one I Do Not Sugar Coat Things; I'm Not Willy Wonka. One thing most moms can agree on is that we need copious amounts of coffee to make it through the day. 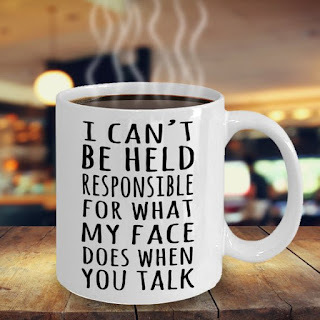 I have a cupboard full of coffee mugs, but I'll always appreciate a snarky one like this coffee mug. It is totally cliche lately, but some moms do enjoy a little bit of wine in the evenings. 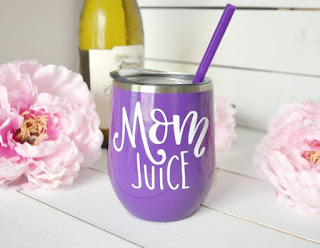 I love the shape of this cup and mom juice helps hide what's inside from the kids. 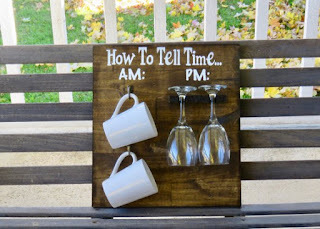 For the mom who loves both coffee and wine, here's a cute wall hanging so everyone can tell what time it is. 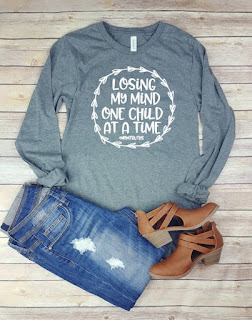 As a mom of three, I can safely say that I lost a little more of my mind with each child. Actually, I'm pretty sure I lost the most of it with my second, but I digress. Once I sit down for the evening, I'm done. Don't ask me for anything because it's not happening. I work from home, so most days I'm in yoga pants or leggings. If I have to wear jeans, I'm not doing it. When I do my makeup, I joke that I'm getting pretty. 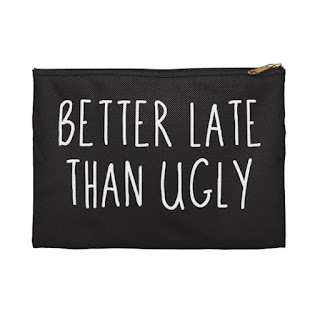 If the mom you're buying for loves makeup and has a good sense of humor, then she will love this better late than ugly makeup bag. 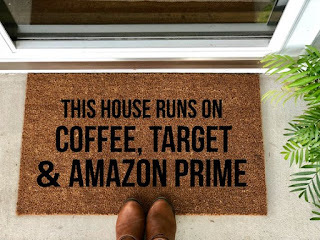 We've already talked about how much I love coffee. I love Amazon Prime so much that me and my UPS driver may have exchanged numbers to make package deliveries easier. Being a mother is exhausting. I'm pretty sure I went five years without sleeping more than 90 minutes at a time. 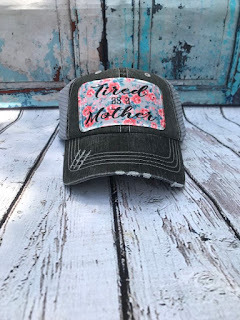 This Tired as a Mother hat also helps hide your messy hair, so it's a double win. 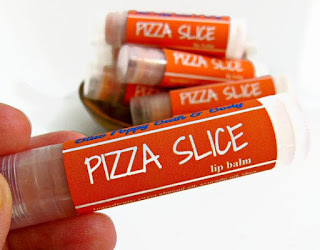 Moms love lip balms and pizza, and this pizza slice lip balm combines them both! Why use a boring vanilla lip balm when you can use this one? I mean, who doesn't want to smell like unicorn farts? This smells like strawberries, peaches, raspberries, and cotton candy. Yum! My kids think I'm a short order cook! 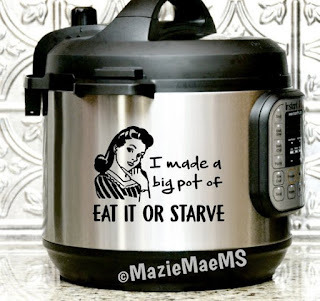 I use my Instant Pot a few times a week, and I think it needs a fun decal like this one. Eat it or starve. My face definitely gives away what I'm thinking! Right? 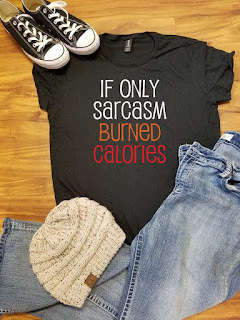 If Sarcasm Burned Calories, I'd be a waif. 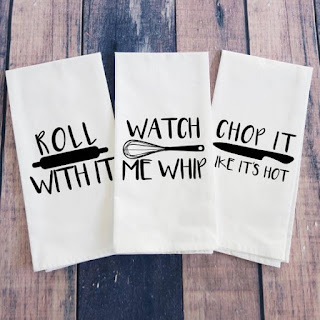 My kids roll their eyes at my music and my jokes, so these funny kitchen towels are perfect. I make lists on notepads every day. Here's my reminder to be be good and not to throat punch anyone. My husband and two kids all said that this bag is perfect for me. Hmmph. 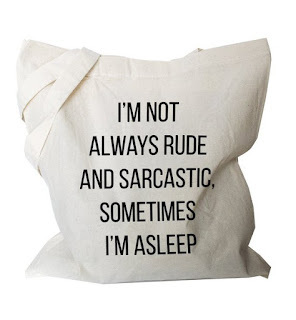 I am usually sarcastic though. Every time I push my kids out of their comfort zones and they success, I ask them, "But did you die?" Not surprisingly, they lived. 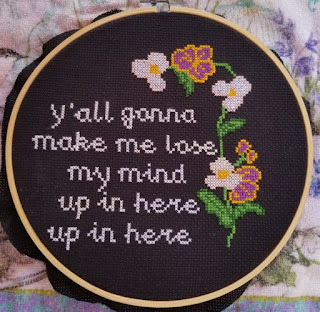 Y'all gonna make me lose my mind up in here up in here. If a mom isn't feeling like she's losing her mind, is she really even a mom? This could be my official "leaving the house" uniform. 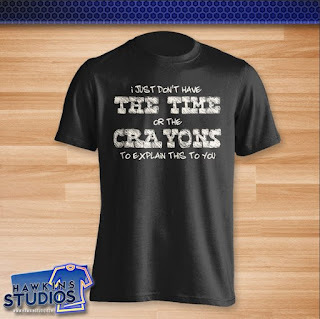 This I just don't have the time or the crayons to explain this to you shirt is perfect for the mom who has to deal with people she may not want to. 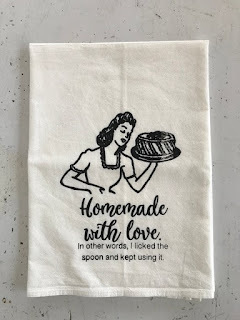 Homemade with love means I licked the spoon and kept using it. Perfect for the snark mom who loves to cook. 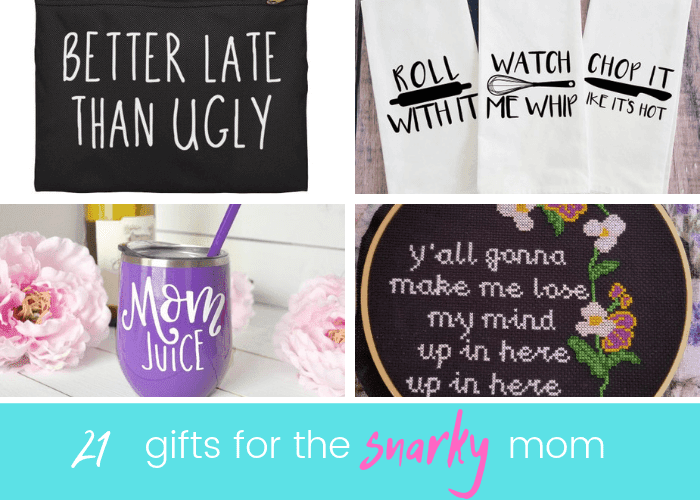 I hope you like my gift guide for the snarky mom with 21 funny gifts for her. Can you think of anything to add?